Today, I’ll be looking at the final figure in the second series of NECA’s Pacific Rim figures. This review will take a look at the lone Kaiju in this series. I reiterate that if you don’t know what that means, stop reading now and go watch Pacific Rim. Actually, even if you’ve already seen it and know exactly what I’m talking about, you should probably go watch it again! 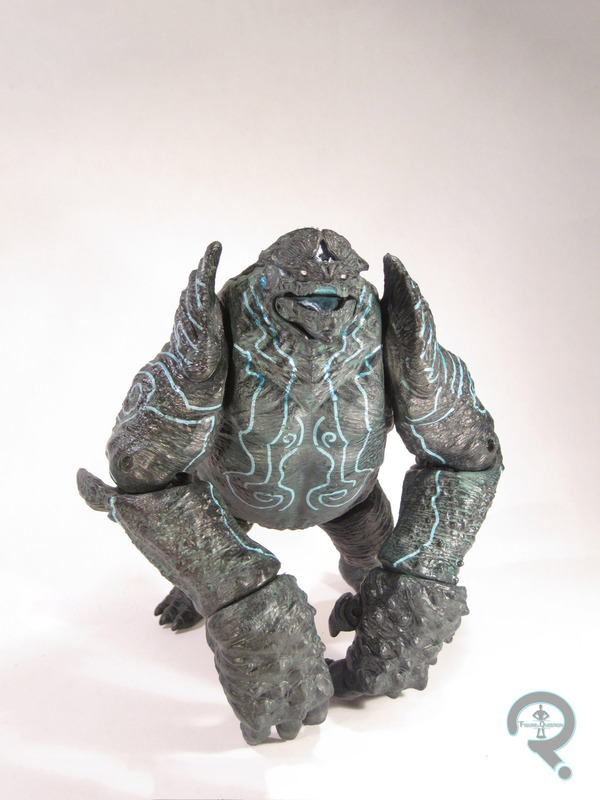 The figure in question is the Kaiju Leatherback. Leatherback doesn’t actually do a large amount in the film, being largely secondary to his companion Kaiju Otachi, but what he does is fairly memorable, and he’s a good pairing with Striker Eureka, so he’s a good choice for the line. Leatherback is in scale with the rest of the line and stands about 7 inches hunched. He has 24 points of articulation. The most noticeable part of the figure in hand is the serious heft that the figure possesses. You could kill a man with this figure. Well, maybe not kill, but seriously maim. Anyway, the figure is pretty well sculpted, especially the texturing on the skin. It lives up to his name. Unfortunately, due to Leatherback’s more organic nature, the articulation is incredibly obvious, especially in comparison to the Jaegers from this series, who all work it in more naturally. Leatherback is probably my least favorite figure in the series, mostly due to the issues with the articulation. However, being my least favorite in this series is far from a bad thing! Leatherback is still a high quality figure, and is a nice contrast to the Jaegers.